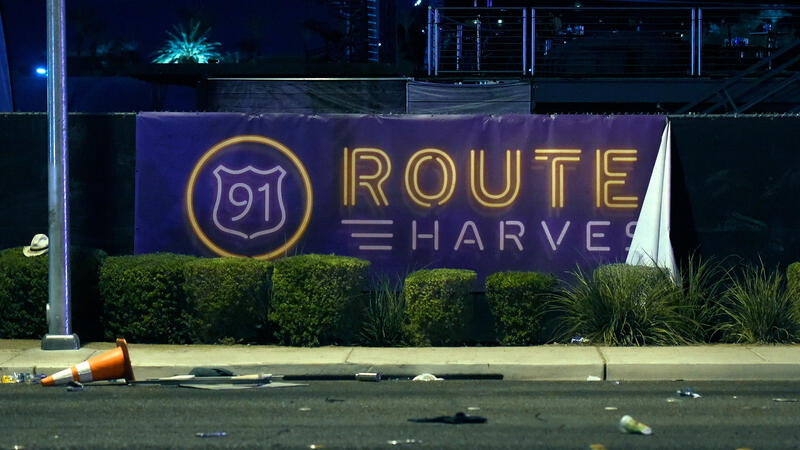 A banner for the Route 91 Harvest country music festival. A shooter killed over 50 and wounded 200 during the festival's final performance in Las Vegas. Around 10:08 p.m. local time Sunday, a gunman — a "lone wolf" according to Clark County Sheriff Joe Lombardo — opened fire on the audience at the Route 91 Harvest music festival in Las Vegas, killing more than 55 people and wounding more than 500 in what is being referred to as the deadliest mass shooting in modern American history. Lombardo said the shooter has been identified as Stephen Paddock. 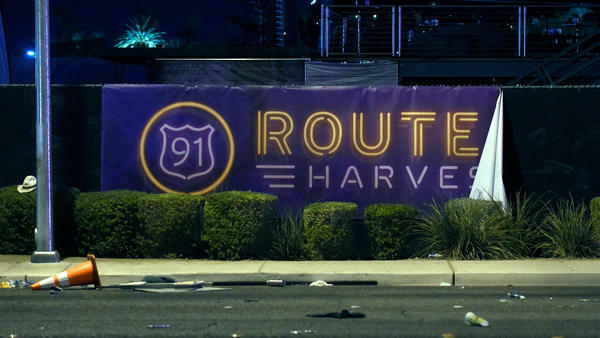 Here's what we know so far about Route 91 Harvest and Jason Aldean, the country star performing at the time the shooting began. Nicknamed "the neon sleepover," this was the fourth edition of the open-air festival, held at Las Vegas Village at the MGM Grand Las Vegas. Attendance last year was reported to be around 25,000, according to Las Vegas Weekly. That is the Village's capacity, according to its website. Passes to the festival sold out in advance in 2015, 2016 and this year. The festival was organized by Live Nation and tour promoter Brian O'Connell, who has also produced the country festivals Watershed in Washington state, Faster Horses in Michigan, Lake Shake in Chicago and Farmborough in New York City. "Las Vegas and country music has always had a special relationship and I think the runaway success of Route 91 Harvest is a product of that, in addition to the artists that continue to come on board and the fans traveling from all over the world to make this festival what it is," O'Connell said in a statement about the festival earlier this summer. Following the shooting, Live Nation CEO Michael Rapino tweeted, "Our hearts are with the victims in Las Vegas, their families and loved ones who are grieving this morning." Paddock fired from a window on the 32nd floor of the Mandalay Bay Resort and Casino, which overlooks the Las Vegas Village. Writer Mark Gray was on the scene at the time of the shooting. In a piece for Rolling Stone, Gray wrote that at first, "it sounded like two firecrackers going off." After attendees began to run from the site of the shooting, Gray writes, he "looked up at Mandalay Bay and saw a light flickering, while shots were still ringing out. Was this the shooter? Maybe. I didn't stare long enough to find out." In an interview, Eric Paddock, the brother of shooter Stephen Paddock, told the Las Vegas Review-Journal, "There is no reason we can imagine why Stephen would do something like this." Route 91 Harvest had a long list of banned items — including stuffed animals and tactical gear — and allowed those with TSA Precheck clearance to bypass general admission lines. A map of the event shows six possible exits, all leading to roads on the Vegas Strip. Photos directly following the attack showed many jumping the fence around the event's perimeter. Following a bombing at Manchester Arena in the U.K. immediately after an Ariana Grande performance, this is the second major attack at a music event this year. Other recent attacks at music venues include the Pulse nightclub shooting of 2016 and a shooting attack in the Bataclan concert hall in Paris during a show by the rock band Eagles of Death Metal in November 2015. Aldean, the headliner at the final day of the three-day-long event, was onstage at the time of the shooting. Top-billed performers at the event's first two days were Eric Church and Sam Hunt. Aldean closed out the inaugural Route 91 Harvest concert in 2014 as well. In a post on Instagram after the attack, Aldean wrote, "Tonight has been beyond horrific. I still don't know what to say but wanted to let everyone know that Me and my Crew are safe. My Thoughts and prayers go out to everyone involved tonight. It hurts my heart that this would happen to anyone who was just coming out to enjoy what should have been a fun night. #heartbroken #stopthehate"
The video below shows Aldean performing "When She Says Baby" as the attack began. The 40-year-old Aldean, born in Macon, Ga., has been one of the biggest stars in country music since the release of his self-titled debut album in 2005. The singer of dozens of country hits, Aldean's three most recent albums, including 2016's They Don't Know, have reached No. 1 on the Billboard 200 albums chart. In April, Aldean was named entertainer of the year at the Academy of Country Music Awards, the second consecutive year he picked up the honor. Aldean began performing at 14 and spent time before a move to Nashville, Tenn., driving a Pepsi truck during the day and playing Macon clubs at night. He has been tied to the rise of "bro country," a power-chord reliant strain of pop-country radio that often takes as its subjects beer, trucks and romance. Aldean is scheduled to headline the hurricane relief benefit Country Rising on Nov. 12 at Nashville's Bridgestone arena.